The shady financing behind Eric Gretiens’ gubernatorial campaign, just gets shadier and shadier. Citizens for Ethics published an article showing that there are connections between the obfuscators behind the SEALs for Truth and the LG PAC. See it here. It’s pretty remarkable that the “outsider” who talks about cleaning up Jefferson City plays the game so unabashedly and with a sophistication previously unseen in Missouri politics. I would argue this goes beyond unethical, and is actually illegal. 130.031.3. No contribution shall be made or accepted and no expenditure shall be made or incurred, directly or indirectly, in a fictitious name, in the name of another person, or by or through another person in such a manner as to conceal the identity of the actual source of the contribution or the actual recipient and purpose of the expenditure. 130.081. 1. Any person who purposely violates the provisions of this chapter is guilty of a class A misdemeanor. KC Star’s Jason Hancock reports (see it here) on the Senate leadership offering dinner with the legislative leadership for a $5,000 donation to their campaign committee. Progress Missouri will hold a press conference tomorrow to express their outrage. Sen. Eric Schmitt’s new ad plays on his status as Missouri’s tallest state senator (maybe ever). See it here. It’s quirky and fun and will help the likability factor – particularly after the negative ads about Judy Baker as the architect of ObamaCare. Sen. Mike Parson’s new ad starts with a horror movie feeling with Hillary Clinton and Russ Carnahan looking like monsters, then things turn sunny as the ad talks about Parson. See it here. Amendment 4 is charging for the finish line. See their latest ad here. It’s a working mom looking at receipts in the kitchen maybe just before making dinner and worrying about how her bills would go up if she had to pay sales tax on the various services (doctor, haircut, rent) of every day life. The Amendment 4 campaign has gotten an interesting question: Would Amendment 4 have any effect on legalizing and taxing marijuana? The campaign’s answer: “NO. Amendment 4 would NOT prohibit the imposition of sales and use tax on marijuana sales. Marijuana is tangible personal property, and there is no exemption in current law that applies to nonprescription sales of cannabis, notwithstanding the fact that its sale is illegal. Thus, the sale of nonprescription marijuana was subject to sales and use tax in Missourians of January 1, 2015, so Amendment 4 would have no impact on whether it could be taxed should nonprescription marijuana sales become legal. The respect Monmouth poll came out yesterday showing Chris Koster and Eric Greitens in a dead tie; Roy Blunt up one point over Jason Kander; and Donald Trump up fourteen over Hillary Clinton. See it here. The mighty Jason Rosenbaum always mentions that the Monmouth poll uses a relatively small sample size, enlarging its margin of error. And I would add that they didn’t include Les Turilli, the Independent candidate (with billboards). I would expect Turilli to take a percent or two – which might matter if the race is this tight. Ben Borowsky is professor emeritus at Washington University and on the advisory board of Missouri Cures. I hope he’s not giving them much advice because someone forwarded me an email he apparently sent explaining why he’s opposed to Amendment 3 and he has no clue what’s in the initiative. I’m a bit befuddled how someone in his position can write something so wrong about a proposal that’s less than three pages long. He obviously didn’t read it, so why is he writing people as if he knows anything about it? Maybe someone else wrote it for him? Why would he put his name on it? “Criminalizes abortion?” “Bans Stem Cell research in the state” Ridiculousness. education. That certainly sounds like a worthwhile amendment. is a principle supporter of Amendment 3. Many health care and educational groups have come out against this measure. Most Missouri newspapers have opposed it as well. I urge you to vote NO on Amendment 3. Did Chris Koster miss an opportunity to strengthen his appeal with suburban moms by not supporting Amendment 3? As Eric Greitens rolls out an ad featuring HIS kids in strollers, Koster chose to align with stem cell community and the teacher unions who have ideological opposition to the early childhood tobacco tax. It would be ironic if that decision ends up handing the election to the Republican and then sets in motion a Republican legislature with the ability to advance its social conservative agenda. Opponents have amassed a fearsome list of folks against Amendment 3… AFL-CIO, American Association of University Women, American Cancer Society Cancer Action Network, American Civil Liberties Union, American Heart Association, American Lung Association in Missouri, American Federation of Teachers Local 420, BioSTL, Campaign for Tobacco-Free Kids, Civic Council of Greater Kansas City, Concerned Women for America of Missouri, Freedom Inc., Greater Kansas City Chamber of Commerce, Health Care Foundation of Greater Kansas City, Kansas City Area Life Sciences Institute, Missouri Alliance for Freedom, Missouri Association of Rural Education, Missouri Biotechnology Association, Missouri National Education Association, Missouri Petroleum Marketers and Convenience Store Association, Missouri Retired Teachers Association and Public School Personnel, Missouri Cures, Missouri Farmers Coalition, Mobilize Missouri, NARAL Pro-Choice, Missouri National Council of Jewish Women, Planned Parenthood Advocates in Missouri, Planned Parenthood Great Plains Votes, Planned Parenthood of the St. Louis Region and Southwest Missouri, SEIU MO/KS State Council, Southland Progress, Springfield Advisory Council of the Healthy Living Alliance, Springfield Area Chamber of Commerce, Stowers Institute for Medical Research, Tobacco-Free Missouri, United for Missouri, Washington University in St. Louis, We Deserve Better… In addition, 113 legislators stand opposed to constitutional Amendment 3, along with gubernatorial candidates Attorney General Chris Koster (D) and Eric Greitens (R) and editorial pages of the Columbia Daily Tribune, Hannibal Courier-Post, The Joplin Globe, Jefferson City News Tribune, Herald-Whig, KMBC-TV, Kansas City Business Journal, The Kansas City Star, Maryville Daily Forum, St. Joseph News-Press, St. Louis American, and Springfield News-Leader. MO Trump Supporter = Proud Vandal? 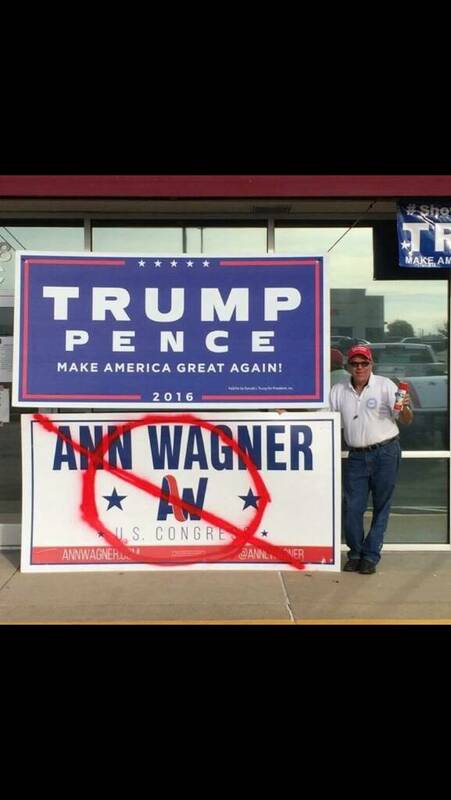 I guess this guy vandalized Congresswoman Ann Wagner’s sign and then took a picture of it with the spray-can in his hand because he’s so proud of his work? See it here. I assume he’s angry that she expressed dismay at Donald Trump’s bragging about how he grabs women. The Missouri Ethics Commission fined Joe Brazil $2,300 for failure to use a “paid for” disclosure and for not reporting a non-committee expenditure. See it here. Chuck Hatfield ‏@chuckhatfield: Just noticed Mo Sup Ct Chief Breckenridge says Missouri-uh. Guess that's how Bar should pronounce during her term. Jefferson City News Tribune seeks Journalist. “The education reporter/Statehouse reporter is expected to look beyond the agenda of a meeting and find the story that’s relevant to our readers. The responsibilities of the beat are to cover local school districts, as well as education trends and issues affecting our audience. Duties would include coverage of the Missouri House of Representatives during the legislative session…” See it here. Rose Ann Korte is the new treasurer of the NW MO Republican Candidate Fund. See it here. Sterling Wells is now treasurer of Plumbing Industry Council Local PAC( see it here) and Plumbing Industry Council State PAC (see it here). Patrick Mulcahy is now treasurer of Friends of Dolan. See it here. Brian Burnett deleted Curators of the University of Missouri. Daniel Engemann deleted Missouri Soybean Association. Missourians for Affordable Energy - $176,982 from MEDA PAC. MO Petroleum Marketers + Convenience Store Assoc PAC - $125,000 from Cheyenne International LLC. Teamsters 245 PAF - $40,000 from Drive Committee. Friends for Chuck Basye - $37,665 from House Republican Campaign Committee. House Republican Campaign Committee Inc - $25,000 from Friends of Todd Richardson. Teresa Hensley for Missouri - $25,000 from Democratic Attorneys General Association Missouri. Friends of Cloria Brown - $22,650 from Missouri House Republican Campaign Committee. Friends of Shaul - $15,471 from HRCC. Friends of Rob Vescovo - $15,471 from House Republican Campaign Committee. The Committee to Protect MO Families PAC Fund - $15,000 from Working Families Committee. Democratic Campaign Committee of St. Louis City - $15,000 from Missouri Democratic State Committee. The Committee to Protect MO Families - $11,994 from Lena Samford. Teresa Hensley for Missouri - $10,001 from Missouri Democratic State Committee. MO Drive Fund - $10,000 from Drive Committee. Koster for Missouri - $10,000 from Martin Grain Company Inc.
Ashcroft for Missouri - $10,000 from RSLC Missouri PAC. House Republican Campaign Committee Inc - $10,000 from Houghton for State Representative. Koster for Missouri - $10,000 from IUPAT. Missouri Senate Campaign Committee - $7,500 from Dealers Interested in Government. Missourians for Byron DeLear - $6,512 from Missouri State Democratic Committee. United Food & Commercial Workers Local #655 Elect Political Action Fund - $6,500 from UFCW 655. Rucker for Missouri - $6,426 from Missouri Democratic State Committee. Missouri Democratic State Committee - $5,400 from Lennon for Boone. Missouri Democratic State Committee - $5,100 from UAW Region 5. Greitens for Missouri- $5,001 from Robert Campbell. Happy birthdays to former Rep. Susan Carlson, and Steel Workers’ Richard Craighead.